As you take a look at your home’s interior walls, they’re deceptively simple because you only see the smooth surface that you paint and clean on a regular basis. Behind this drywall, however, is a system of wood beams or studs. The walls, floors and ceilings use these studs for support. In fact, the entire home depends on the wood beams for its overall stability across the years. When you want to hang a picture, add a fixture or other major item to the wall, you need to know where these studs are located. Avoid any frustrating mistakes by using a stud finder. These devices take the guesswork out of your structure’s design and streamline the entire project’s timeline. If you plan on working with your stud finder several times a year, you need a reliable device that will keep on delivering detailed information. Your best choice in these devices is the ProSensor 710 by Franklin Sensors. The manufacturer examined most of the common concerns voiced by everyday consumers, and they created an electronic device that addressed those needs. 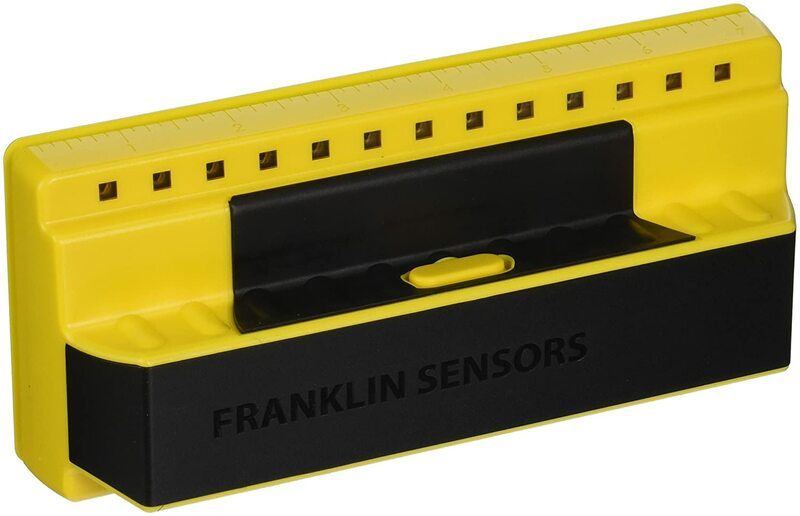 Although the Franklin Sensors model is one of the more expensive devices, you’ll be thrilled with its accuracy and durability through each project. You’ll always know where the activation button is on this device because it’s an indented plastic button. Place your hand on the finder, and rub your finger against the button area. When you’re busy evaluating an area during a project, there’s no time to fumble with an on button. Allow the indentation to guide your finger into place. With a swift press of the button, the unit takes readings almost immediately. The readings come from embedded sensors. Franklin Sensors examined many different consumers’ reviews, and they decided that an array of several detectors was necessary. Because the sensors are hidden within the sturdy housing, they aren’t subjected to a lot of damage as you use the device during each project. They’re placed strategically within the unit so that you can achieve the most accurate results. With so many sensors, you might wonder if the results will be too complicated to understand. Luckily, Franklin Sensors takes this concern into consideration. The unit visualizes the sensor results by converting them into light. Your stud finder has 13 LEDs or light-emitting diodes that illuminate based on the sensors’ results. Each light corresponds to an obstacle in the wall. With one swipe of your hand holding the device, you’ll instantly know where you can place that next nail. You’ll be happy to note that the illuminated LEDs directly correspond to an obstacle. The wall might have two studs a few inches apart from one another. Place the finder on this wall surface, and the LEDs will light up where the beams are located. You’ll immediately know where the center of the stud is without any mistakes. Product reviewers do have one concern regarding the 710 ProSensor. It has a less than 2-inch depth when you hold it against a wall. Although its compact design is a positive aspect, this depth can be a drawback as well. Some users may find it difficult to hold this particular device as they slide it against a wall. Every person will have varying dexterity, so you may want to experiment with several finders before you buy one. This model might be perfect for your hands, whereas other users may find it hard to hold. As you hold the device against the wall, the scanning mechanism isn’t limited to the immediate area beneath the finder. In fact, the 710 ProSensor has a large, scanning area of about 7-inches wide. This feature makes your work a lot easier as you evaluate an entire wall surface. It’s not necessary to scan every inch of the wall. You simply use it for one square area and move forward. When you have a large project, this device will save you considerable time. The wide, detection area is also enhanced with a deep-scanning feature. The 710 ProSensor will scan up to 1.5-inches deep into your wall. This depth is ample enough to locate studs, pipes and other objects that might be hidden behind the drywall. You don’t want to strike any items with a nail, especially pipes or wiring. This scanning depth is dependent on the wall’s material makeup, however. Thick, plaster walls might be more difficult to scan than drywall. Some consumers report that the stud sensor has difficulty with certain insulation types. Although most wall insulation is fiberglass based, other styles have a foil backing. This metal component can confuse the stud finder. You’ll need to experiment with your walls and verify if foil backing is present. An alternative stud-finding strategy might be necessary for these walls. This stud finder only uses basic batteries for its operation. Add two, AA batteries to the housing, and you’ll have hours of accurate scanning. The device doesn’t come with the batteries installed so you’ll need to buy them separately. Stud finders don’t take a lot of power to operate, which makes alkaline batteries perfectly suitable for this device. Alternatively, add rechargeable AA batteries to the 710 model. You’ll have a device that runs at any time. Because of this product’s compact size, slip it into your tool belt as you move around a project. This stud finder measures about 7-inches wide with a 3-inch height. Keep it handy as you add nails or outlets to your walls. If you’re ever questioning a wall area, it’s a good idea to double-check the stud’s location with the finder. As a result, you’ll have an accurate measurement of any space with few mistakes that can cost a lot of money. A strong product for almost any application is the HD800 model by Zircon. Also known as the StudSensor, this device offers you a brightly lit display with an ergonomic handle that’s easy to grip. Locating a stud should be quick-and-easy work, and Zircon developed their product to do just that. Find your studs, hang a picture and move onto other parts of your project in no time. This particular tool has numerous features that will please any amateur or professional handyperson. 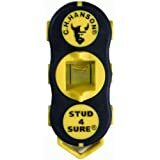 This stud finder is incredibly lightweight, which allows you to slip it into almost any tool belt. At 6.4 ounces, this device only adds a fraction of weight to your workload. Add it between your hammer, screwdriver and other hand tools. The device only requires one, 9-volt battery too. This power requirement means that the battery adds little weight to the device. You don’t have to worry about hauling a lot of heavy tools to a project when this product barely tips the scales. For most consumers, the scanning depth is one of the most important considerations during the stud-finder research process. This tool offers you two, main scanning depths at 0.75 inches and 1.5 inches for wood beams. A deep scan for wood is usually not possible with other products because the tool simply can’t detect items deeper than one-half inch. The Zircon unit is different because it has advanced sensors that can reliably perform with each deep scan. The scanning abilities improve even more when you put the unit into the metal-scan mode. The device uses a different set of detectors at this point, which enhances the scan to about 3-inches deep. You can find rebar or copper pipes with this scanning mode. Locating any metal objects is critical during most projects because you don’t want to damage them with drills or nails being pierced into the nearby materials. All of these scan modes are easily selected with the three-mode switch. Located on the front housing, this switch clicks back and forth as you watch the selected mode illuminate on the display. Select metal, edge or center scans. The Zircon unit can find the edge of a stud in order to understand its width dimension, or look for the beam’s center point. You’ll have a visual representation of the wall with this tool, and no hidden items will be damaged as a result. Zircon designed this device to work in both bright and poorly lit areas. The display is backlit, which allows you to see it in almost any light situation. If you’re visually focused on a task, it’s possible to use this stud finder as you listen to its audio tones. Slide the device across an area, and keep your eye on another detail. The tool will indicate when it’s detected a stud. Your attention can then be diverted back to the stud finder so that the entire project can remain on time. Some consumers have reported that this tool isn’t as reliable as first advertised. It works well on basic drywall, but textured areas can be an issue. If you need to work on a wall with a thick texture, contact the manufacturer for further instructions. They can walk you through an enhanced set of instructions so that the device can respond in the appropriate manner. False readings can occur if the unit isn’t handled in the proper way. A unique addition to this stud finder is the signal-strength indicator. As you move the device across a wall, it will tell you when a discovered item is either deeply embedded or shallow in nature. You don’t even need to toggle between scanning modes to benefit from this feature. With this information, you can gauge where your next nail can be placed in a safe manner. The StudSensor has a simple switch on the front of the housing, which allows you to toggle between scanning modes. As you slide the device across the wall, be aware of the mode that you’re in. The switch and the housing tend to blend together because they’re both black hues. You might even accidentally switch the mode with your finger. When you’re using the right mode for the application, you’ll have reliable and accurate results each time. You might have a limited tool budget so finding a quality stud finder may be tricky. 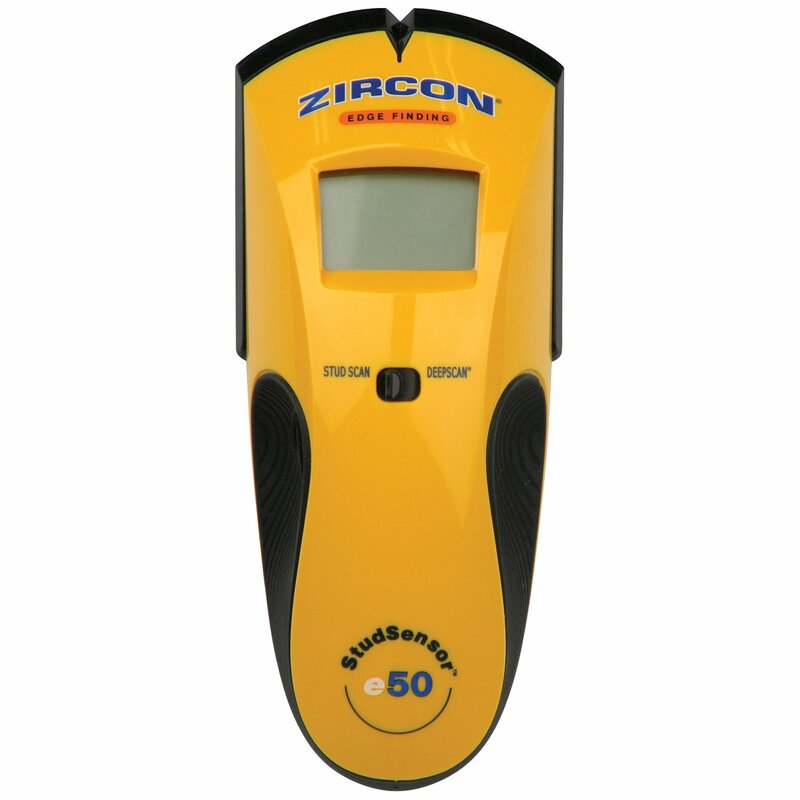 However, Zircon offers their e50 model for under $20. They can be found both online and in local stores. At first glance, this product is a basic tool found in almost any garage. It has a bright-yellow housing with a clear display. This StudSensor unit, however, has many key features that makes it stand out in the busy marketplace. Take a close look at what this device can offer your next project. As you place this product on your wall, you’ll be thrilled with the scanning design. The e50 doesn’t surprise you with an alert when it hovers right above a stud. In fact, this tool provides you with a progressive alert as the unit approaches a wall obstacle. As a result, you’re able to plan your project with even greater detail. You’ll know exactly when the stud begins and ends. Some homes have beam edges or flat sections pressed against the walls, so the stud dimensions can vary widely. Some consumers have reported that this unit isn’t very versatile in their homes. It cannot be used for alternative areas, such as tile floors or wall exteriors. Read the product’s instructions carefully before you operate the device. Use it on drywall only. It can have some errors when it’s used on thicker materials because it’s not designed for those applications. Zircon offers alternative products for areas that aren’t basic drywall. As you slide this detector against the wall, you’ll encounter several studs. Take advantage of the indentation that’s part of the unit’s housing. This crevice is meant for your contractor’s pencil. Make a mark at this point whenever the stud finder indicates a center or edge. Step back from your work area, and you’ll see a pencil representation of the studs after a complete wall scan. Use the pencil marks as final guides for your next project step. Be aware that this device comes with a WireWarning feature. Electrical wires are often hidden inside the walls. As you pass the e50 across the project area, it will tell you when a live wire is within 2 inches of the drywall’s surface. Make a pencil mark in this location so that you can avoid any contact with the wire. Damaging a wire can be expensive to fix, and it’s a possible shock to your system as well. Along with the housing’s indentation, you also have another marking feature with the spotLite pointer. A light actually illuminates across the wall when a target has been pinpointed. This feature is especially helpful when you’re in a darkened work area. There’s enough light for you to mark the area with precision. Without the feature, you might have pencil marks that are slightly off from their target area. It may feel like you never locate a stud in a timely manner, but the e50 device makes discovery much easier. If you place the stud finder directly on a wood beam, the unit won’t produce a false reading. It actually sends out an alert that tells you it’s over a stud. You’re able to alter your scanning motion, and you’ll find the entire width of that wood beam. In the end, you’ll know where every wall obstacle is with just a few minutes of scanning. 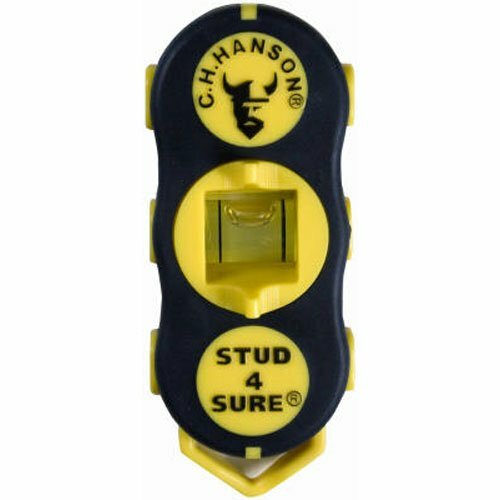 When you need a stud finder that’s less than $10, you’ve found the solution in the 03040 model by CH Hanson. In fact, the manufacturer advertises that this device doesn’t have any moving parts. You’re simply using basic magnets to locate your wall studs. Products without moving parts will often last much longer compared to other devices that house complex components. When you need a simple detector in your home, the CH Hanson model is a clever tool. The first feature that you’ll immediately appreciate is the lack of batteries. This unit has no electronic parts that require power. Basic magnets are always turned on so power issues will never be a problem. If you’re always looking for spare batteries, you’ll be thrilled to have a tool that doesn’t need the added accessories. Inside the 03040 product is several magnets. Because the manufacturer chose industrial-strength magnets, your stud-finding process should be incredibly easy. These magnets essentially create an energy field that narrows down a metal object. There are no displays or sounds to follow either. Be aware of the pull from the product as it zeroes in on a metal object. You’ll know when you’re over a stud by just the magnetic sensation alone. Don’t pull the detector away from the wall when it locates a hidden object either. Allow the unit’s rare Earth magnets to take over as it automatically sticks to the wall. You’re able to work hands free as you hammer in a nail or pinpoint a cabinet location. In the end, you aren’t following a set of pencil marks on the wall. Follow the detector’s markings, which will only streamline your project’s timeline. One concern voiced by many consumers is missed studs. Because this device is magnetic, it’s not detecting the wood beams. It’s actually honing in on the nails and other metal fasteners attached to the studs. A wood beam with no metal pieces will be overlooked by this device. Although this detector has a major drawback, the manufacturer makes up for that issue by adding a helpful vial on the housing. Rotate the vial for either horizontal or vertical work. You’ll always add items to your wall that are plumb and level. You’ll never have crooked cabinets or improperly hung artwork when you follow the basic level. The curved housing on the detector allows you to grip it with ease as you move it in the signature “S” shape across the wall. Dropping this device is almost impossible because of the handy grips, and the magnets will catch onto a nearby metal section if you do lose your grip at some point. Try the CH Hanson model out, and you’ll have a tool that will last for several years. Ideally, you want a stud finder that will verify what you’re actually finding behind the drywall. Look for a model that has both wood and metal detection. You may need to toggle between these modes, but they will provide you with the best overall indication. Some of the top detector models will actually have wire indicators. If you plan on performing a major project, such as a remodel, a wire-detector mode is critical. You don’t want to drill or cut into a wall and damage the hidden wires. At the bare minimum, the stud finder should tell you if it detects the wood beam or metal object as you continue with your detecting process. Regardless of the stud finder’s scanning design, it should have a widespread feature. Locating a wood beam cannot be efficiently completed with just one magnet or electronic detector. Choose a device that has more than two detectors so that it can cover several inches of a surface at any one time. Multiple detectors will narrow down an object and provide an accurate result. Using only one scanning component opens up the unit to possible false readings. You’ll always need to move the device around the wall, but it should cover several inches at a time during this process. Most consumers will want a stud finder that offers a backlit display and pencil-marking spots. The display provides you with all of the necessary information about your scanning process while the housing indentation makes pencil marking a swift action. The device shouldn’t be difficult to hold either. You’ll be using it for several minutes at a time, so the outside housing should be comfortable and formed to your grip. Some manufacturers have added other helpful features, such as level bubbles. These components don’t have to be calibrated or powered. You simply reference them as needed. Match your project application to the stud finder’s specifications. Some models are more heavy-duty types, so they can be used on thick, plaster walls. In most cases, basic detectors will only work on drywall surfaces. Consumers are often frustrated with a product when they use it inappropriately, such as on floors or in shower stalls. If you have an unusual application, contact the manufacturer before purchasing the stud finder. They have professionals who can guide you to the right product. Save the basic detector for those drywall areas where studs are difficult to find otherwise. As you compare all of the different devices on the market today, your final choice is entirely up to your needs and comfort level. Always pick a device that you feel is easy to work with on a daily basis. The instructions should be clear in your mind without any confusing aspects. If the tool doesn’t properly operate because of instruction confusion, false readings can be the result. Return any stud finder that doesn’t work for your applications. When you keep the receipt and original packaging, the item can be returned as you try another one that fits your uses around the home.